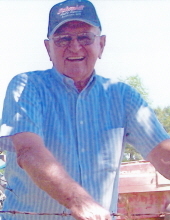 Eddie Gene Schmidt, age 90, of Sullivan, Missouri, passed away Monday, April 8, 2019 at Missouri Baptist Hospital in Sullivan, surrounded by his family. Eddie Gene was born on July 28, 1928 at Elmont, Missouri, the son of Charles Henry and Maude Alice (Blankenship) Schmidt. He attended Miller School and graduated from Sullivan High School, class of 1945, where he was the class president. As a young man, Eddie Gene went to work for Modern Garage for a time. He then entered the United States Army, where he served in the 82nd Air Borne and was stationed at Fort Bragg. After his military service, he returned to work at Modern Garage. Eddie Gene was united in marriage to Verna May Dace on November 14, 1953 and they were blessed with four children: Danny, Sally, Dennis and Ellen. In the spring of 1954, Eddie Gene and his brother, Harold, purchased Modern Garage. In 1982, Eddie Gene and Verna May bought Harold’s share in the business. In 1994, Eddie and Verna sold the business to their son and his wife, Danny and Sandy Schmidt. This allowed Eddie Gene to focus on farming and cattle, which he enjoyed very much. Eddie Gene is survived by his wife, Verna May (Dace) Schmidt of Sullivan, MO; four children, Danny Schmidt and wife, Sandra, of Sullivan, MO, Sally Farrell and husband, J.B., of Sullivan, MO, Dennis Schmidt and wife, Mendy, of Sullivan, MO, and Ellen Woodruff and husband, Rob, of O’ Fallon, MO; 9 grandchildren, Heather Winkelman and husband, Jack, of Imperial, MO, Emily Hardy and husband, J.T., of Sullivan, MO, Rachel Chaney and husband, Darin, of Sullivan, MO, Lydia Leigh and husband, Tim, of St. Peters, MO, Alison Revelle and husband, Josh, of Sullivan, MO, Jared Schmidt and wife, Abby, of Sullivan, MO, Ross Farrell and wife, Mallory, of Sullivan, MO, Charley Schmidt of Sullivan, and Paige Woodruff of O’Fallon, MO; 16 great-grandchildren; brother-in-law, Don Dace of Bourbon, MO; one sister-in-law, Peggy Schmidt of Sullivan, MO; nieces & nephews, other relatives and many friends. He was preceded in death by his parents, Charles and Maude (Blankenship) Schmidt; six brothers, Russell Schmidt, Earl Schmidt, Hadley Schmidt, Harold Schmidt, Roscoe Schmidt and Jimmie Dean Schmidt; an infant sister, and 3 additional sisters, Ava Lindsey Owens, Anita Cartwright and Ruth Stevens. Funeral services will be conducted 10:00 AM, Saturday, April 13, 2019 at First Baptist Church in Sullivan, with Pastor Chester Lahmann officiating. Interment will follow in Schmidt Cemetery. Visitation will be held from 4:00 PM to 8:00 PM, Friday, April 12, 2019 at First Baptist Church in Sullivan. Memorial contributions may be made to: First Baptist Church Building Fund. To send flowers or a remembrance gift to the family of Eddie Gene Schmidt, please visit our Tribute Store. "Email Address" would like to share the life celebration of Eddie Gene Schmidt. Click on the "link" to go to share a favorite memory or leave a condolence message for the family.